In the high mountains of northern Vietnam—not far from the Chinese border—lies the alluring Sapa region: well-known for its mountainscape, temperate climate and for being home to several Vietnamese ethnic minorities. We arrived at our hostel feeling a bit antsy from the bus trip. It was too early for bedtime and too late to go out so we went up to the porch, joining a group of other guests eating and playing card games. Suddenly in the distance, a loud thunder rumbled, and in less than 5 minutes a storm was above us. The lightning, heavy rain, and strong winds blew the plates from the tables and the cards from people hands, scaring us all to the dorms. The storms were consistent during the 6 days we stayed in Sapa, greeting us every late afternoon or early evening, and lasting for 30 to 40 minutes at a time. If you’re visiting Sapa between May and September, pack a raincoat. Just to be sure, check Sapa’s rain forecast here. Our trip from Hanoi to Sapa was on a Queen Bus company bus, it took around 6 hours and cost €9,45. The same trip can take up to 8 hours if done during the night. Check other ways to get to Sapa here. 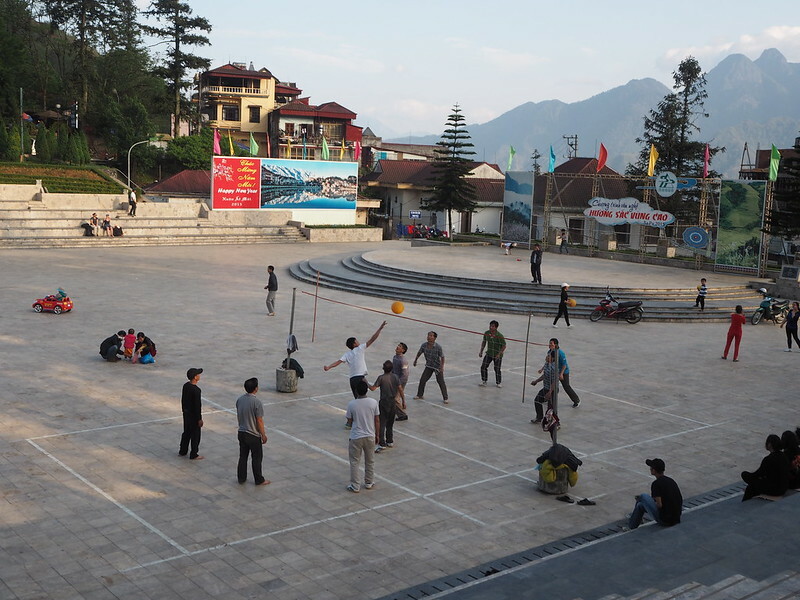 All buses stop at the New Sapa Bus Station: about a 10-minute walk from the city center. When the bus stopped a large entourage awaited us, only this time the taxi drivers were outnumbered by women dressed in embroidered indigo blue dresses. Right away, these Hmong women started offering themselves as guides for a mountain trek—one of the popular activities to do in Sapa. You can read all about the Sapa trekking experience here. Four of them followed us to the city center where more women joined in to sell us handicrafts: “Sir, buy something from me!”. They mobbed us, insisting on buying something or schedule a mountain trek. When you say you don’t have any money, they’ll point to the ATM. If they see a tourist buying from the competition, they’ll flock over to him and try to sell one more. 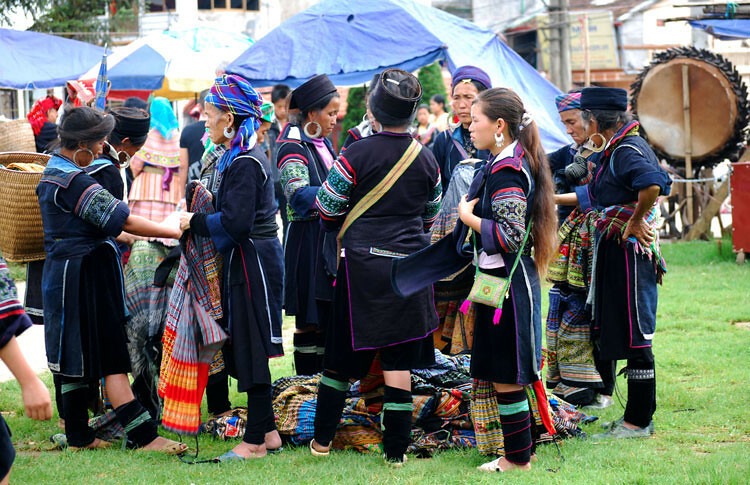 But even though this constant haggle is annoying, it’s important to understand that Hmong and Dao women are the main earners in their families and depend solely on the money they earn from tourists. Yes, their selling tactics are a bit aggressive, but it’s not an easy life when everybody else sells the same that you do. Other than the odd Disney and Scooby doo statue scattered throughout, the entire hill is beautifully gardened, and the more you go up the better the view gets. In the center of the park is a venue where you can watch a traditional dance show, however, none of the dancers seemed particularly excited to be there. The show time table will be printed on the entrance tickets. At the top—1800m high to be exact—is Sânmây or the cloud yard, where you’ll have a 360º view of the mountains that surround Sapa. It’s a two storey building right in the city center, showcasing the history of the town and the hill-tribes living around Sapa. It’s a tiny museum desperately needing upkeep with a souvenir shop downstairs. 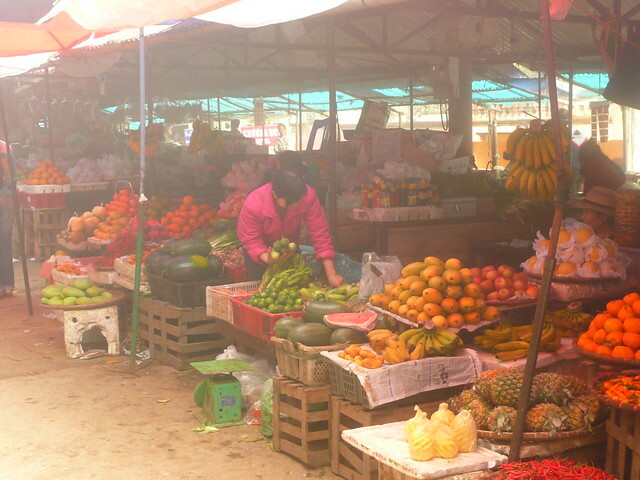 It’s a small local market near the new Sapa Bus Station similar to any other Vietnamese markets selling fresh produce. If you tend to get lightheaded at the sight of freshly-killed dogs and horse body parts, avoid the meat section. You’re welcome. Some stuff just can’t be unseen. The most popular activity in Sapa and we wrote all about it here: Easy guide to Sapa mountain trekking. Trying to move around as independently as possible (and knowing beforehand that it could be done), we attempted to outline a trip to the Bac Ha markets by public transports. Finding the correct information turned out to be impossible, so we gave in and booked an organized tour. We paid €10.76 each for an 8-hour tour to the Bac Ha markets, a typical village, and the Lao Cai border. It took more than 2 hours on a mini-van to get there, arriving almost at noon. By then, the majority of people walking around were tourists, and the few ethnic women that remained were clearly fed up with them and their cameras. The market was divided into areas of commerce: foods and drinks, textiles, vegetables, meat, and cattle (again, dogs included). Cat-Cat is the most touristy but the nearest to Sapa. Then there’s Ta Van, Lao Chai and Ban Pho for a more serene vibe. Some of these villages require you to purchase a permit in advance at the Tourist Information Center in town—although if you book a trekking tour here (which we don’t recommend) the permit fee is already covered. By default, this visit should be a part of your trekking experience, so there’s no need to buy separate permits or tours to do it. The Bac Ha market tour that we mentioned before, included a visit to one of this typical ethnic villages, and it was awful. They round up all of us foreigners and bulldozed us into humble tin houses, walking in line snapping pictures of the people inside as if it was Disneyland. Not cool. It’s best to do it in a less invasive way and accompanied by someone that actually lives in the village—like your trekking guide. 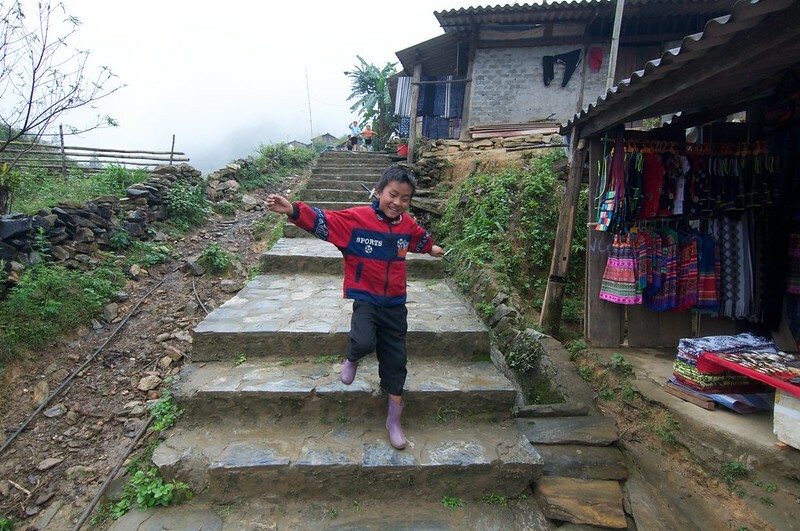 See all that a Sapa trekking experience involves here. It looked like a construction site with trucks, dust, gravel, and bricks scattered all over. Hotels, shops, and cafes abound, and you’ll be approached constantly and incessantly by every vendor possible, including children. 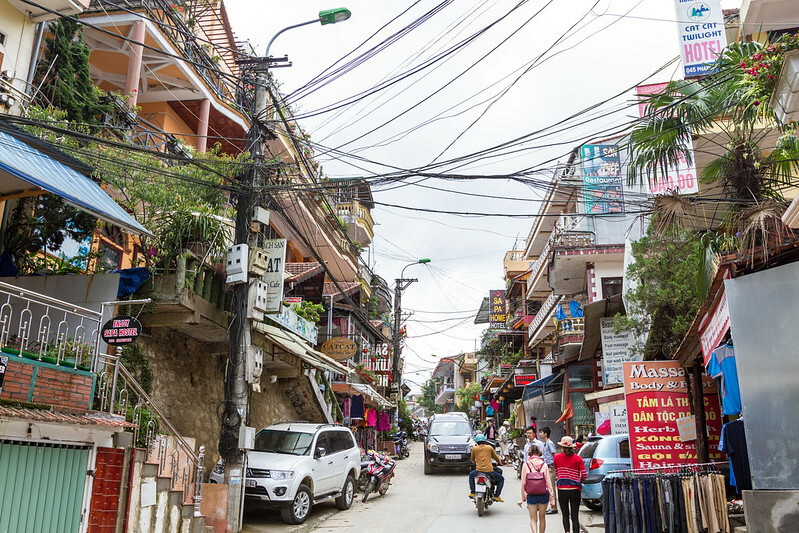 We arrived on a Thursday with a one-night reservation at the Go Sapa Hostel—we always book one night first to see how the place is, and if we like it, we extend our stay. We got stuck in a tiny dorm room with 4 bunk beds, where everybody threw their backpacks and wet towels on the floor, so by the next morning, we were out of there. Strangely, all affordable hotels were fully booked for the next 2 nights. 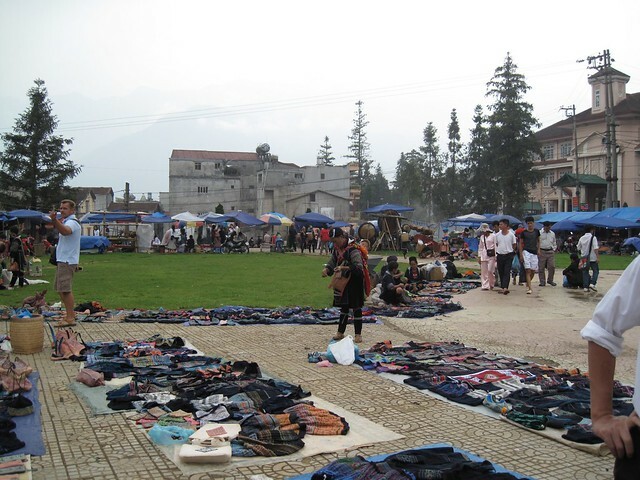 It was like every backpacker in Vietnam decided to visit Sapa that weekend. Resigned to no alternatives, we went back to the Go Sapa Hostel to book one more night: “We’re full. No more rooms”. Long story short: Sapa is a big weekend destination for Vietnamese people. The prices of hotel rooms triples and availability drops dramatically, so book ahead! Luckily our desperate looking faces got us a “room” at the Sapa Ruby Hotel, where the family altar was and spare furniture was stored. Days later—during the week—we changed to the Sapa Sunflower Hotel: super affordable and with breakfast included. The banh mi was our food of choice here in Sapa. We ate them for breakfast, lunch, and dinner. They’re delicious, cheap and can be found in every other food stall around town—each with their own banh mi variation. Sapa was our final stop for 6 days after 1 month of traveling through the length of Vietnam. The calm of the mountains, the fresh air, and the glorious landscapes was the best way to bid farewell to it.